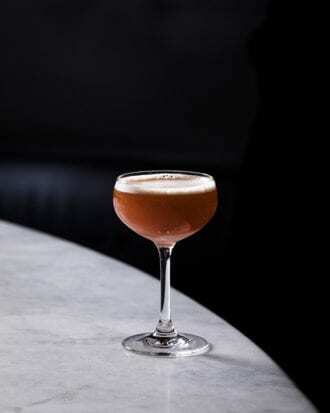 At the original Death & Co. location in New York, Matthew Belanger assembles this tequila cocktail with a tart layer of rhubarb, raspberry and citrus to brighten up the rich flavors of aged agave and apple brandy. Raspberry Syrup: Combine 1 quart of raspberries and 3 cups water in a saucepan, bring to boil for about 8 minutes. Allow to cool for about 10 minutes, then strain through a chinois. Combine the raspberry water with equal parts superfine sugar by weight and stir until the sugar dissolves. Transfer to a clean container, label and refrigerate for up to 2 weeks. Erik Carlson uses a light, blended whisky that doesn’t compete with the bold flavors of the IPA in this take on a classic shandy.